Posted June 29th, 2016 at 1:58 pm | Log in to reply. Hello Maangchi,hope you are good? I tried to make egg muffins. Posted June 8th, 2016 at 9:57 am | Log in to reply. Hello maangchi, I finally made mak kimchi after planning for so long. But I ended up putting too much garlic!! So all I can taste is the garlic! I’ve left it outside on the counter for the last 3 days and even though the garlic taste has reduced its still very much garlicky!! Is tbere a thing I can do? I feel like the salt is less too since I didn’t add squid or oysters I only added the amount of salt you added during the salting process directly to the kimchi. Should I add more salt? I feel like I can’t taste anything but the garlic when i eat!! 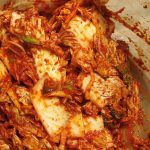 Please help-I was so excited to make the kimchi cause I had been planning to make it for months. Can I add more fresh vegetables and kimchi paste made withour garlic to this batch? It’s already fermented 3 days on my counter (today first time bubbles came when I opened). Please tell me what to do!! Thank you so much!!! Posted June 8th, 2016 at 10:23 am | Log in to reply. You made kimchi for the first time! That’s great! 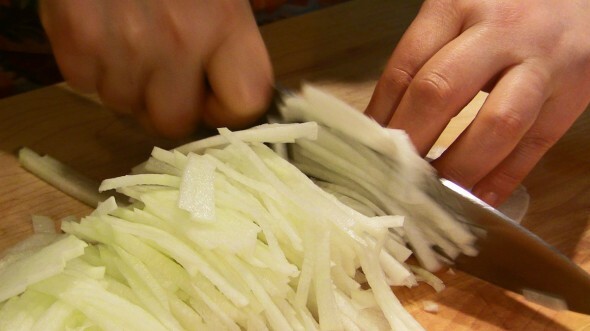 If the kimchi turns out too bland, add some salt. You can add salt anytime. When the kimchi ferments, strong garlic smell will tone down. Posted June 8th, 2016 at 10:31 am | Log in to reply. Maangchi, thank you so much for your response. 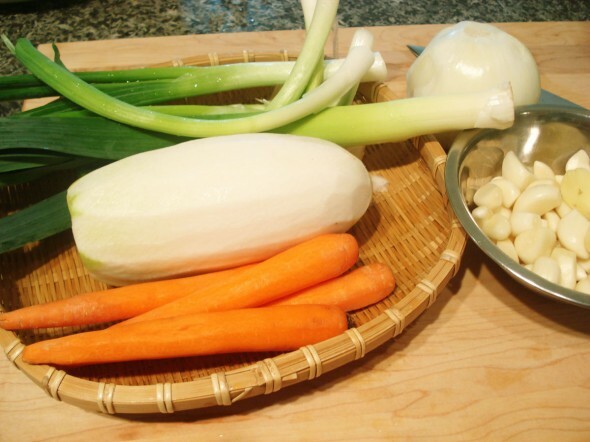 But other than letting it ferment – isn’t there anything else I can do to reduce the garlic flavor? I can’t eat it fresh at all cause the garlic taste over takes everything. I’m so disappointed in myself. :( will adding some more cabbage after washing in salt and water reduce the garlic taste? Posted June 15th, 2016 at 11:59 am | Log in to reply. 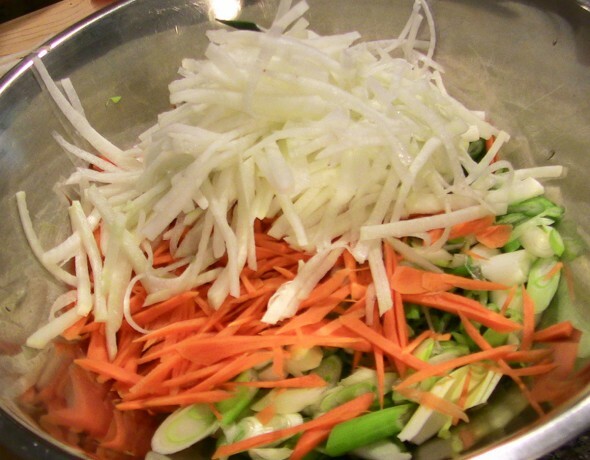 You might try making a partial batch of kimchi without garlin, and mix7it together. I would think that should dilute the garlic flavor. Good luck! Posted June 3rd, 2016 at 5:00 pm | Log in to reply. Hello again Maangchi! Now I have a lot of kimchi! I really want to make things like kimchi stew and kimchi fried rice which needs well fermented kimchi. Can I keep the kimchi on the counter for a while to hasten the ripening and not have to wait for a couple months in the fridge? If so how long is it OK to keep on the counter? and then how long should I keep in the fridge for the great ripe flavor? Thank you! Posted May 22nd, 2016 at 11:19 pm | Log in to reply. Hello Maangchi! Thank you so much for all your recipes! I’ve tried so many and loved it! 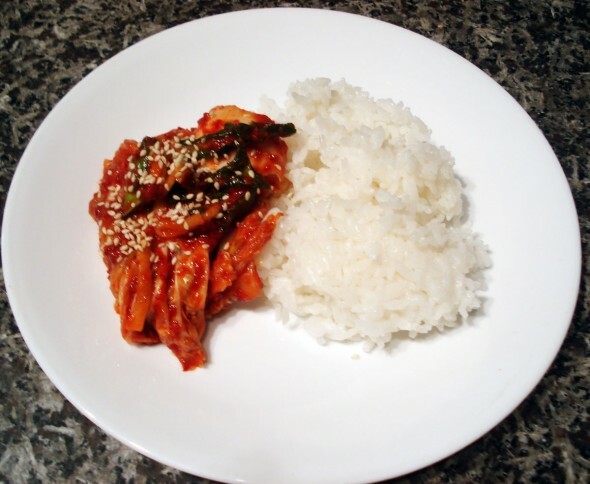 My favorite still has to be dakgalbi and we love the addition of kkaenip. 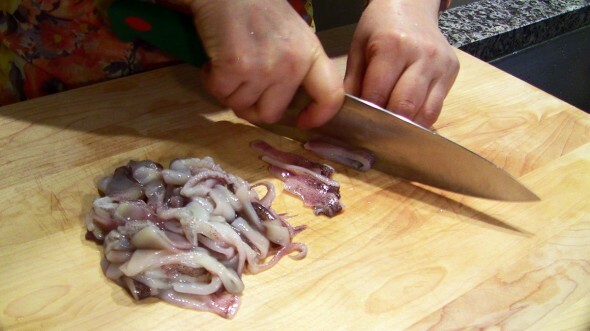 I’ll be making this kimchi recipe soon and was wondering if I could leave out the oysters/squid? I can’t seem to find fresh seafood near me and would prefer not to risk a stomachache :) Thank you so much! Posted May 22nd, 2016 at 7:24 am | Log in to reply. Maangchi. I bought hot pepper powder instead of hot pepper flakes. Can i still make kimchi with the powder? I was planning to make it tomorrow! :( thanks! Posted May 22nd, 2016 at 9:32 am | Log in to reply. Posted May 18th, 2016 at 1:15 pm | Log in to reply. Hello Mannchi! In this recipe you do not state the kind of salt you are using? Is it kosher salt or sea salt from Korean stores? Coarse or fine? What kind of salt should I use? Maybe someone can recommend? Thank you so much! Posted May 18th, 2016 at 10:18 pm | Log in to reply. Posted May 19th, 2016 at 12:10 am | Log in to reply. Thank you so much Maanchi! I like Kosher salt too for the very same reasons and for making cooking simpler. This makes it all easier! Posted May 17th, 2016 at 4:32 pm | Log in to reply. I have made your recipe 2x in the last 2 weeks as a surprise for my (Korean) boyfriend’s birthday. The first time, I used a little too much garlic (leave it to an Italian, ha!) but after a week, the garlic mellowed. 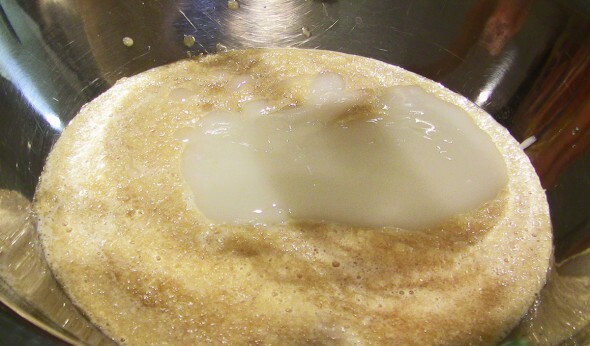 However, it did have a carbonated effect / taste, so I think I did not ferment it properly in the beginning. The second time around, I made the paste perfectly (he said the color was good, and the taste) and no fizzi-ness, however, I used a different salt (a kosher / coarse salt, instead of the fine sea salt I bought at the Korean grocery store) and we think this made the cabbage too salty (because the sauce is not salty, just the cabbage after taste). But he said the direction I’m going in is right. 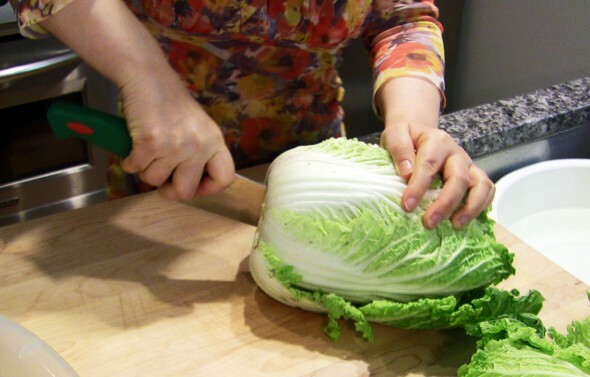 1)When you first soak the cabbage, how long do you actually soak it for in water, before you put it in the salt? 2) This time I am going to add fish sauce. Which brand do you recommend? I haven’t used fish sauce the last 2 times because I was worried it would be too fishy, but I am ready to try it. Posted May 17th, 2016 at 4:34 pm | Log in to reply. 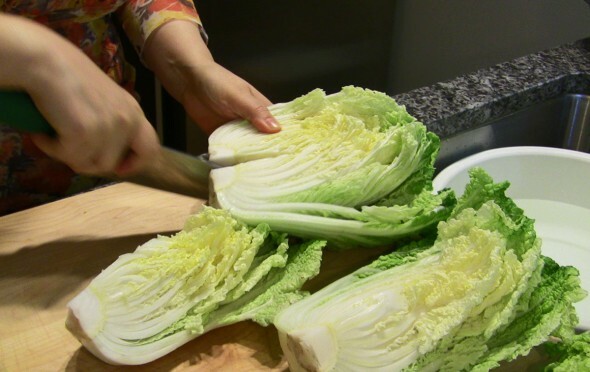 I forgot to mention that the second time, after I finished making the kimchi, I did not refrigerate it right away. Instead, I left it out on the counter and then put it in the fridge the next morning. I think this helped greatly to avoid the carbonated effect from the 1st time. Posted May 18th, 2016 at 7:44 pm | Log in to reply. Posted May 17th, 2016 at 2:09 pm | Log in to reply. Hi Maangchi. I hope you can answer this question. The last time I went to my local Korean market to purchase ingredients for mak kimchi, I couldn’t pass up a package of radish kimchi that the ladies make. (I was so hungry and ate my fill in the car!) The Korean ladies there make all kinds of great kimchi, pancakes, salads, all the good stuff! So, I then went home and made my batch of kimchi, and since I had juice left over from the store-bought, I put about a tablespoon of the sauce in each of my 8 quart mason jars. In just a few days the kimchi was bubbling and over-flowing the jars! It was so carbonated it was like “eating” a cola! My question is, do you know, as a Korean “insider” if the people who make fermented kimchi for sale in the markets use a starter culture, like a packet of lactobacillus and other cultures? My kimchi has never, never been so well-fermented than this last time when I added juice from “their” kimchi. Take care! Love you! Posted May 4th, 2016 at 11:10 pm | Log in to reply. Hi Maangchi, can I use fresh hot peppers for kimchi instead of hot pepper flakes? Posted May 17th, 2016 at 4:19 am | Log in to reply. Grind the fresh peppers until creamy and mix with garlic, ginger, fish sauce and follow the recipe. You don’t need to add porridge. Posted April 30th, 2016 at 11:03 am | Log in to reply. Maangchi! I have been making this recipe for more than 7 years and I still keep coming back to it. Thanks for turning the world onto Korean food (and good kimchi). Posted May 21st, 2016 at 7:59 am | Log in to reply. It’s been a long time I heard from you! 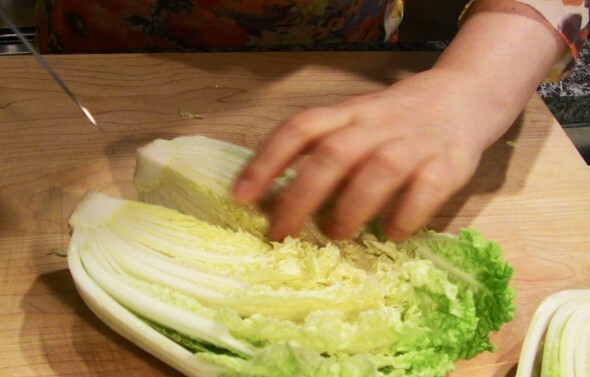 I’m happy to hear that you have been making your own kimchi for years! Didn’t you say you are a vegetarian when we ran into each other at an event in Brooklyn a few years ago? I’d like to taste your kimchi someday! Posted April 29th, 2016 at 4:40 pm | Log in to reply. 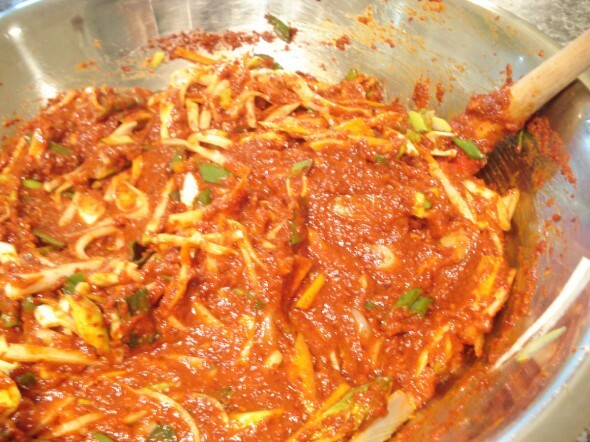 I am still enjoying making your mak kimchi! Today I went to the Korean market to purchase supplies and since it’s Friday, the Korean ladies were there selling their pre-made kimchi and I just had to buy some to eat in the car. It was sooo good! I used three very large heads of napa, one large radish, an apple, and all the rest. I left it salting for two hours, then mixed it up and put it in the same size plastic box that you used in your 2010 video. (I usually use about 5 quart-sized Mason jars, but all were in use today.) I was surprised that the cabbage reduced to only fill that large box a little more than half way! Next time, four heads of napa in my cart! These three weighed about 10 pounds. Even though I’ve been doing this for some years now, the shrinkage always surprises me. 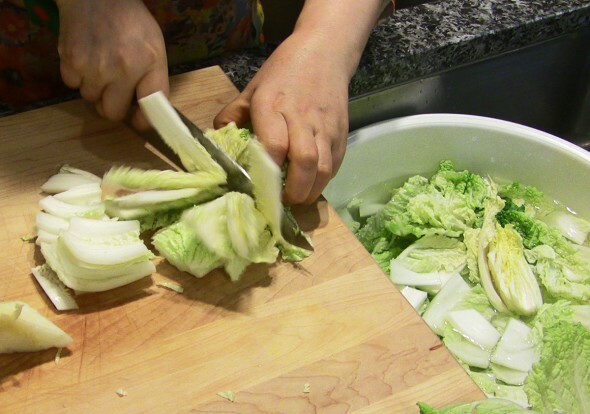 This picture isn’t exactly artistic, but I want to prove to you that I do make kimchi! 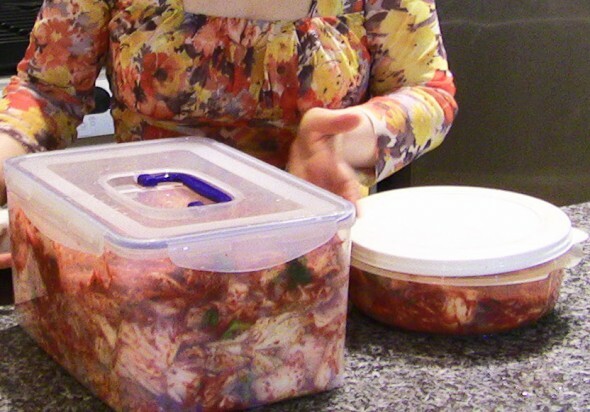 Imagine all the people who think of you fondly when eating their own home-made kimchi! As always, thank you for your wonderful videos, recipes, and instruction so freely offered. I still love your cookbook and it owns an honored place on my shelf. Posted April 14th, 2016 at 4:46 pm | Log in to reply. 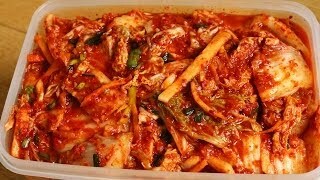 Here’s a newly made batch of easy kimchi. It’s gonna make my whole apartment stink, but I believe it will be tasty. I’m just gonna let it ferment for few days and then it’s time for tasting. Yummy! Posted April 14th, 2016 at 5:25 pm | Log in to reply. Posted April 15th, 2016 at 5:41 pm | Log in to reply. Posted April 13th, 2016 at 11:32 am | Log in to reply. Hi Maangchi! I’ve made the second batch of kimchi. I have let it ferment for 2days at room temperature. Now the kimchi taste very very sour. What should I do now? Posted April 4th, 2016 at 7:12 am | Log in to reply. Hi Maangchi! I’ve just made my own kimchi for the first time. Can’t wait to try :) At the same time, I can’t stop my hands from reaching the container. While I’m letting it ferment at room temperature, am I suppose to leave it alone? Can I open the cover or taste it during this process? Posted April 4th, 2016 at 10:31 pm | Log in to reply. You can open the container anytime you want. It looks good! Congratulations! Posted April 5th, 2016 at 10:49 am | Log in to reply. Posted April 15th, 2016 at 5:39 pm | Log in to reply. You can add salt any time if it turned out bland. 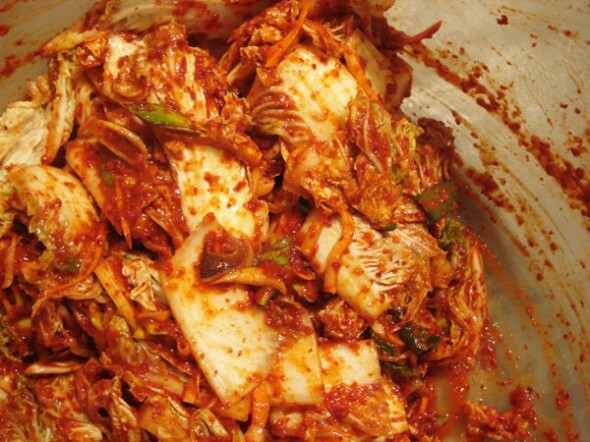 Once your kimchi turns sour, you should transfer it to the fridge. Or keep it in the fridge right after making your kimchi. Posted March 27th, 2016 at 4:13 pm | Log in to reply. Wonderful! Your videos are very informative. I had a hard time understanding many other videos. My first batch came out great. Although I have only tried supermarket Jared Kimchie. Just finished second batch and it’s even better. Thank you! I am make it just for myself. Do you have a cut down recipe? Or can the extra Kimchie paste be saved? Much thanks! Posted April 4th, 2016 at 4:29 pm | Log in to reply. The video was watched 10,534,839 times on YouTube & has 100,645 likes!